Restoring Illusions of Grandeur in the Philadelphia Academy of Music Ballroom | John Canning & Co. Proposition 1 The Decorative Arts arise from, and should properly be attendant upon, Architecture. Proposition 37 No improvement can take place in the Art of the present generation until all classes, Artists, Manufacturers, and the Public, are better educated in Art, and the existence of general principles is more fully recognized. Owen Jones is the Brothers Grimm of architecture decoration fundamentals, historic pattern styles, and color schemes. He didn’t invent them, but he commissioned the pattern drawings, articulated the propositions, and published the collection. This compilation, in continuous publication since 1856, remains relevant as a guide to historic decoration and as a resource for its restoration. Today, our “classes” make up the ideal restoration team – architects, artisans, and owners. And the John Canning Company’s role as historic preservation artisans is not only to conserve, protect, and restore original architectural ornament, but also to educate building owners and those in charge of ongoing maintenance in how to care for and protect their treasures. If Owen Jones is the authority on historic decoration fundamentals, then the AIC (American Institute of Conservation) is the authority on its conservation. The AIC Code of Ethics for conservators of historic and artistic works sets forth a professional set of standards that guide our work. The same standards guide owners in setting their expectations, and even in writing bid specifications. There are two phases of historic conservation and restoration. The first phase answers the question, “what do we have?” It is a conditions assessment and paint analysis, the results of which are delivered in a detailed report. With this information, the restoration team - architect, owner, and artisan - answer the question, “what do we want to do with it?” They discuss both necessities and options and define a scope of work that can go out to bid for the second phase, implementation. 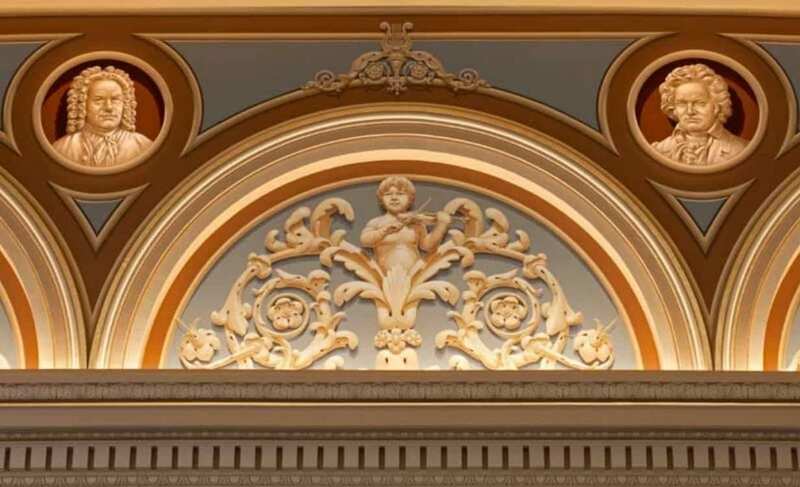 Our work at Philadelphia’s Academy of Music Ballroom illustrates both project phases, the conditions survey and the restoration of the original 1857 decoration. The building was designed by architects Napoleon Le Brun and Gustavus Runge in the Renaissance style. The original decoration of the ballroom was an elegant French style common to performing arts centers of the period. But that was not in evidence at the time of our investigation. We were first hired by KlingStubbins, project architects, to perform a conditions survey and historic paint study of the room. The goal was to determine the original color palette, decoration, and any fine art in evidence. We were guided by one ca. 1860 black and white photo of the ballroom. It was large enough to show us not only where to look for original decoration, but also where fine-art murals might be found. However, it did not have enough detail to show us exactly what those designs were or what the murals depicted. Going back to the AIC Code of Ethics, our approach followed best practices in exposing original decoration, and sampling colors for scientific evaluation. 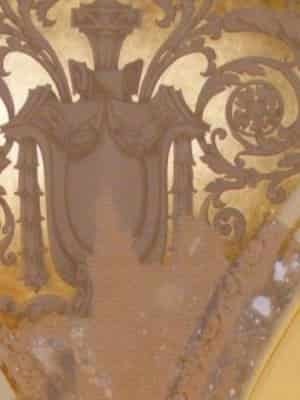 In addition to the 1860 photo, on site, we saw evidence of the original decoration in the ambulatory outside the ballroom. This helped to confirm the decoration style, though not the specifics. Working from a scaffold tower that allowed us access to the upper walls, columns, and ceiling vaults, we conducted paint exposures and extracted fifteen paint samples, inclusive of all layers and substrate. These were carefully bagged and labeled as to location before sending off for scientific color analysis. The samples were prepared for analysis using a mounting medium and heat. Then they sere sanded to achieve several precise cross-sections for microscopic inspection. The sample was photographed at magnification under a variety of light sources. Some sections were stained with chemical compositions to reveal the paint formula, e.g. oil, protein-base, synthetic, mineral, etc. From these photos and tests, each layer color and paint composition was identified. In addition to the scientific paint analysis, we also conducted a field study. Working from the historic photo, we selected areas of decoration and suspected decoration. Using both a small knife, like a surgeon’s scalpel, and conservation-grade chemical stripper we began to open “windows” exposing previous decoration schemes. The visible, amateurish decoration was removed to reveal a more sophisticated design beneath. But, another decorative scheme could be seen ghosting through that design layer. It appeared to be consistent in style with what we could see in the historic photo, and with the sophistication of the painted decoration in the ambulatory. However, using the exploratory techniques available to us at the time, our attempts to expose the ghosted decoration layer failed. This led us to believe, and laboratory findings later confirmed, that the original decoration was done with protein-based paints (caseins and emulsions) which are generally water soluble and therefore difficult to separate from subsequent paint layers. Speaking of layers, the analysis of our samples showed 5 to 16 layers of paint, 2 of the layers being the plaster substrate and a primer. The ceiling showed only one generation of repainting identical to the original decoration. There were up to 16 layers at the pilasters, and an average of 9 layers in the higher areas. Knowing that the original decoration was done with protein-based paints led us to recommend a different chemical composition for the final paint removal. This was successful, but only to the point of revealing the shadows of details. Armed with the scientific paint analysis, the historic photo, and our extensive knowledge of historic decoration, those faint shadows provided enough hints for us to envision and recreate the ballroom’s original decoration scheme. In preparing the surfaces for restoration, we were able to adjust the proportions of the chemical solvents we used to strip away paint layers and further expose additional, original decoration schemes. In exposing the original decoration, we uncovered exquisite trompe l’oeil and grisaille patterns. One of the most interesting was the addition of trompe l’oeil decoration to the architectural details of the pilasters that gave the appearance of additional dimensional detail. Ultimately, we were unable to identify all the detail of decoration, especially the figurative fine-art work. 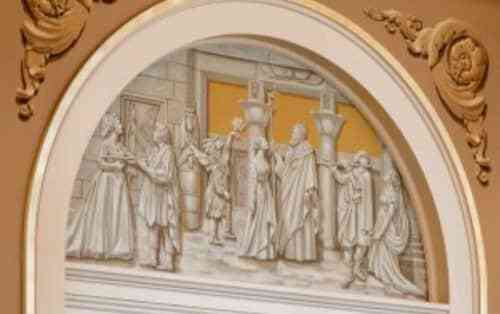 For example, the 4 corner, ceiling roundels appeared to have grisaille paintings of composer’s busts. With the information we had, we just couldn’t be certain exactly who they were. Our restoration team turned to the history of the Music Academy to select famous composers who had performed there, or whose noteworthy work debuted there. The lunettes in the historic photo, now covered with mirrors, looked as if murals had once been there. We removed the mirror panels, fabric underlayment, and plywood framing beneath that, to reveal another period of decoration, but not the original artwork. The restoration team understood that some of the original design would not be identifiable and had accepted the need for conjectural design details to be added. The lunette artwork was one of these areas. It was decided by the Academy of Music that scenes from Mozart’s operas would be created by our fine artist in the grisaille style established for those areas. The restoration of the ballroom included restoring its magnificent chandeliers. In doing so, what was unknown, yet essential, was the color and amount of the light that the new chandeliers would cast. We had identified the paint colors and patterns for the vault section decoration and created it on canvas in our studio. Before proceeding, we had to confirm that those colors would “read” the same way under the ballroom lighting conditions. If they didn’t, we would have the information we needed to tweak them properly, and could extrapolate that adjustment to the other palette colors. This presented a challenge for the restoration team. We needed to put the mock-up in place temporarily. To properly evaluate the colors from the floor, we asked the general contractor to remove the working lights and the scaffolding, and to install a light source to replicate the color and intensity of the final conditions specified by the designer. After we evaluated the color (which didn’t take long), the contractor would have to put everything back. As you can imagine, this was not a popular idea. It was not met with enthusiasm. But after much discussion and explanation the contractor agreed and we were able to evaluate the color properly. This is just one example of how important it is for conservation professionals to take the time to educate others on the intricacies of achieving authentic historic restoration. We had the pleasure of working with an ideal restoration team on this project. We defined goals together and respected our individual and combined challenges in achieving them. All of our work was guided by a clear, shared intention to execute, to the extent possible, a faithful restoration of the original design scheme. Canning’s focus was on producing quality work on schedule, our opportunity to do a faithful restoration, and our responsibility to add new design elements that were consistent with the original design style without imposing our own aesthetic. The Academy of Music ballroom stands as an authentic and sensitive restoration of the 1857 interior. The reinstatement of the design required every bit of our conservation and restoration knowledge and skill. From the stabilization and replication of plaster substrate and ornament to stenciling, glazing, striping and gilding. The ballroom decoration scheme is one of the finest, and most extensive, examples of applied tromp l’oeil moldings and carvings as well as an elegant display of period grisaille ornament, sculpture, and fine-art. We are honored to have played a part in polishing this historic decoration gem.